What would we give to have a good root beer float again! Seeing the ice scramble seller always had us scrambling for our barya, and slurping on the unnaturally-colored slush was easily a major highlight of our childhood days. Who would've thought that evaporated milk, banana flavoring, and an assortment of sweet toppings would make such a good combination? Watching cotton candy vendors make pastel-colored puffs using a stick and some powdered sugar is a borderline magical experience. If we can't have a freshly spun sugar cloud to call our own, we'd make sure to choose the largest piece displayed on the wire attached to the vendor's cart. For a lot of Pinoy millennials, fruit juice concentrate was a household staple growing up. Sunny Orange, with its catchy jingle, was a leading favorite. Sing it with us: "Sunny Orange, I love you! Lemon, grape, and strawberry! Sunny Orange, tasty drink! Sunny Orange, super quality!" Before we got spoiled for choice by the various imported and artisanal chocolate available on the market, there was Serg's, the 90s kid's first choco love. They had several variants, but our favorite would probably be the colorful candy-coated Moonbits, which were every bit as good as their Stateside counterpart. It's still a summertime favorite! This frozen treat was the perfect way to cool down during a summer afternoon. Eating this was, more often than not, a messy affair (we were still figuring out the art of eating melting food back then), but it was a learning experience we'll never trade for anything. On the rare occasion that we were allowed to have junk food for merienda, we would always opt for cheese curls. The best part was when all the curls were gone and we'd end up licking our cheese dust-covered fingers clean! We usually only had pies during special occasions, which made us savor each slice we got to eat. Though the combination of bananas and vanilla cream made it a very indulgent treat, one slice was never enough to satisfy our kiddie sweet tooth. The mere inclusion of the grown-up word "beer" in "root beer" made us feel so badass every time we drank the stuff. Never mind if we preferred our root beer with ice cream—it was still the one drink that made us feel like mature, knowledgeable adults despite being barely 10 years old. Eating these treats won't bring back your youthful innocence, but at least you can relive the good ol' days with McDonald's new Good Times Desserts! 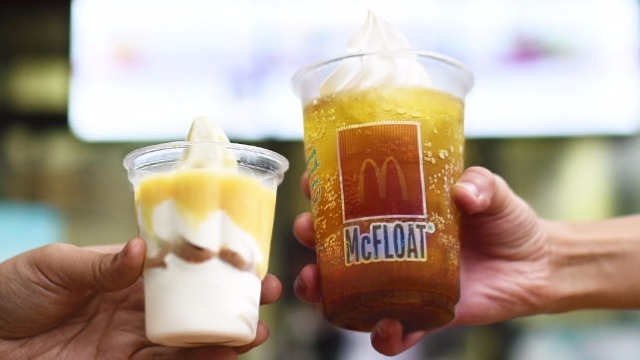 Savor the refreshing Golden Rootbeer McFloat and the delicious Banana Crème Pie Sundae to make your throwbacks more fun, letting you make new memories while reliving the best days of your youth. Taking a trip down memory lane has never tasted this good. Try it now! The McDonald's Good Times Desserts are available at all McDonald's stores, dessert centers, take-out counters, and drive-thrus nationwide. You can also order via McDelivery.